"Chic and uber cool - that's the new digital clutch by the world-renowned designer Vivienne Tam and HP. 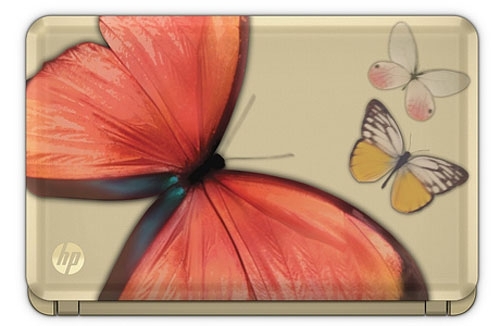 Inspired by the classic Chinese love story concerto 'Butterfly Lover', often described as the Chinese version of 'Romeo and Juliet', the design features elegant butterflies that are brought to life on a champagne gold backdrop." There's not much more to know about this beyond the design, and, according to Techtree, the screen size is moving up from 10.1 inches to 11.6 inches. It's not coming out until spring of 2010, which seems like a long wait, so we'll have to see what kind of specs it has. This very likely means that the next generation of HP Mini will also move up into the 11.6 inch screen range. I don't know if that move makes sense - the 10 inch screen on a netbook is the perfect blend of size and readability, and when I look at the 12 inch screen on the dv2 I see it as a laptop that's not that much smaller than the my XPS M1330. Although maybe this means the Vivienne Tam computer won't be a netbook at all - maybe it will be part of a new line of Windows 7-based notebook computers. Want to see more? Lots more pics at the HP Flickr page.